Locations and contact information for area financial institutions. The Office of Community Affairs is housed within the Division of Outreach, Engagement, and Regional Development at NIU. It builds connections between the university and local businesses, residents, government, and various groups and organizations, primarily within the City of DeKalb. Downloadable pdf file from the NIU Office of Community Affairs highlighting resources available to area businesses from NIU. Kishwaukee College offers resources for employee training and professional development to keep DeKalb County companies and employees competitive in the global economy. Available resources and information include customized training, OHSA & safety training, small business development, leadership development, and upcoming business development events. 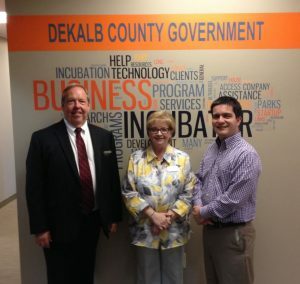 The Mission of the DeKalb County Business Incubator has been designed to foster and support, in an office environment, the initial development of new ideas by emerging entrepreneurs which can then evolve into a successful business for them and add to permanent/long-term economic growth throughout DeKalb County. The Small Business Initiative was created in 2010 to provide a comprehensive source of available information and resources for DeKalb County small businesses. Downloadable pdf business resource guide produced for the City of DeKalb. The Sandwich Economic Development Corporation is a public/private partnership that facilitates the retention, expansion and attraction of business investment to enhance the economic vitality and quality of life for the City of Sandwich. The Illinois Department of Commerce & Economic Opportunity (DCEO) (https://www.illinois.gov/dceo/Pages/default.aspx) has compiled a clearinghouse of information on starting a small business in Illinois. INTERSECT Illinois is a new economic development organization dedicated to increasing Illinois’ competitiveness, focusing on business development, and creating jobs. INTERSECT Illinois works with the Illinois Dept. of Commerce and Economic Opportunity (DCEO) and other economic development organizations throughout the state to promote Illinois’ strengths and resources. SCORE is a non-profit association dedicated to helping small businesses setup, grow, and achieve their goals through education and mentorship for over fifty years.